Ok maybe I’m being just a little bit facetious with this post. However, last week scientists at Lund University in Sweden announced that they have confirmed the existence of Element 115 currently known as Ununpentium. This is very cool news in the world of science. If my memory serves me, scientists may have made this discovery a number of years ago, but I guess now it’s “official”. Some kind of committee of physicists and chemists will now review the finding before adding it to the periodic table of elements. Beyond the sheer coolness of the discovery, the announcement stood out to me for another reason. If any of you have ever watched any of the alien shows on the discovery channel or “science” channel, you may recall some guy named Bob Lazar. This guy claims to have worked at Area 51 (or more specifically some above top secret site near Area 51) reverse engineering UFOs. Now I should probably state that I don’t actually believe Bob Lazar, but his story does make for great science fiction nonetheless. According to Lazar, the UFOs were powered by Element 115. Allegedly, a particular isotope of Element 115 under proton bombardment would get bumped up to Element 116. This element would then rapidly decay, releasing antiprotons in the process. The antiprotons were then used for matter-antimatter annihilation inside a reactor. He also made an off-the-wall claim that the strong nuclear force that holds protons inside the nucleus (despite them wanting to repel each other), is really just gravity. Needless to say, there aren’t any physicists that would endorse such a claim. He also claimed that gravity waves are just like sound waves in that they can be amplified. The way the UFO traveled through the universe was by using the enormous energy produced by the antimatter reactor to amplify the gravity wave from the nucleus of an atom. Presumably, this would operate like some sort of warp drive. All told I’d have to give Lazar an A for effort. It’s a cool story that would have made a great science fiction novel. Unfortunately, given the disconnect from reality, it’s unlikely we’ll be generating antiprotons from Element 115 anytime soon. With that said I want to turn our attention to an idea for creating an anti-gravity drive that, at least to me, sounds like it could plausibly work. I’m pulling this idea from a youtube video that I stumbled across while browsing the internet one night. I’m not going to link to it because, alas, the kid in the video ventures off into conspiracy theory land claiming that the government already has this technology etc, but it’s still intriguing. Let me state upfront that I believe I got either B’s or C’s in my undergraduate physics classes, so if someone who actually knows something about physics is reading this and it’s totally wrong please let me know. It seems correct to me, however. Now if that video didn’t blow your mind consider this — a levitating superconductor can lift 70,000 times its own weight. That 3 inch disk in the video is only a few microns thick. If it’s thickness was increased to only a couple millimeters, it could levitate a small car. Now while this is certainly an incredible phenomenon and very well may have practical application in the future, it’s not going to allow for interstellar travel. So let us continue. Like superconductivity there is another bizarre state of matter called superfluidity which is where fluids flow with zero viscosity. 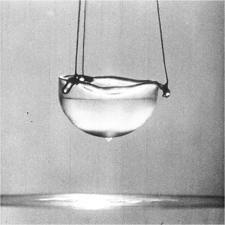 The following is a picture of a superfluid flowing up the side of a glass. Again, just don’t ask how it is possible. Now given that a superfluid flows with zero viscosity, that means if we were to put it into some kind of centrifuge and spin it, it would not slow down due to friction. If it never slows down due to friction, in theory, that implies we should be able to accelerate a superfluid to the speed of light. The problem is that when you put a stick in a superfluid and attempt to stir it, it doesn’t actually stir. Instead the individual atoms just spin on their axes. So we need to find some way of spinning this superfluid. If it were possible to either discover or possibly create in a cryogenics lab a superferrofluid, that is a magnetic superfluid, then you should be able to spin it using electromagnetism. You would simply wrap the centrifuge in a superconductor basically turning it into an electric motor and accelerate the superfluid to some high percentage of the speed of light. Now the big question is what happens when the fluid in the centrifuge reaches relativistic speeds? It’s an impossibility for the fluid to reach the speed of light since objects gain mass as they gain velocity. An object moving at the speed of light would imply infinite mass. However, we would expect the centrifuge to gain mass (and hence generate an increasing gravitational field) as fluid spins up to relativistic speeds. Yes I realize that it wouldn’t actually get to the speed of light, but it would be interesting to see what would happen to the spacetime around the centrifuge at, say, 50% or 70% the speed of light. Love the science water only thing 3 States hydrogen feul cell? since earth has a magnetic field,then it is a magnet itself right?…for anti gravity engines to be built does not require sophisticated science but simple apparatus and deep senses. I would like to build an antigravity bed. Imagine your body floating while you sleep. No need for a mattress anymore. How comfortable would that be? It would have to be the best sleep ever lol. I tell you one thing if someone did invent one it would revolutionize the sleeping industry providing it was affordable…. already available on the market, it is called ISS and cost a few million USD per night ! Have you ever been scuba diving. I once scuba dived near an underwater steep cliff, and this experience was a feeling as if I were floating in zero gravity space. Once you get your buoyancy at an equilibrium with the water, you just remain suspended at a fixed level. Of course one might run into trouble if he fell asleep, as it isn’t safe to remain at those pressures for more than about 30 – 45 minutes. Isn’t there already a super-fluid which is ferromagnetic – 3He ?? I wonder why hasn’t someone already done his. I have always argued that C is just too damn slow. Find something 100 LY away it still takes at least 100 years at full C… how are we supposed to explore the universe like that? That’s why I am particularly excited with Alcubierre’s expansion/contraction model. Forget speed – “pinch” space and move. Who knows? Maybe quantum locking is a part of this we haven’t pieced together yet. You’re absolutely right, but moving at C would at east allow easy traveling of our solar system. We could then install colonies on other moons/worlds to remove the single point of failure we currently have on Earth. This is incidentally how the engine on the TR-3B is supposed to work. I came up with a way to do this with just conventional MgB2 and a buffer layer that acts as a transition medium between the superconductor and “normal” space so the Cooper pairs flow around the surface and the resulting antigravity field from the resultant e-e/ positron pairs extracted from the quantum vacuum pushing it into hyperspace but for it to work the entire ship would need to be covered in the hyperalloy composite with no gaps. Even a single micrometre gap would cause dangerous shearing forces and tear the ship apart at more than a fraction of C.
Old hairy goat says that some particular interstellar craft are made in a field/bubble of zero point gravity out in space. This allows for the craft’s ‘hyperalloy composites’ to be molded and seamless, hence no problem with micrometer gaps. Certain intelligence even fuse their alloys with sentience/consciousness, yielding a somewhat symbiotic awareness/presence within the craft. Hence why some interstellar craft are controlled purely by the telepathic capabilities of its occupants. Obviously way beyond human intelligence, when humans are still dealing with morons hoping to take over the Earth with quantum computers and playing with concurrent time/space realities. Better off just being a stinky old goat chewing grass, I’d say. Maybe humans can learn something from their stellar brothers. Oh! But of course-interstellar craft aren’t real! The author of this blog says “Bob Lazar’s story is a great science fiction!” Let me tell you author of blog- the truth of it all is stranger than science fiction. Dare to think outside conventional limitations! For you are only becoming an aberration of your own existence. I was gonna make a similar comment but since yours is so eloquently written, I will end on that note! Has anybody thought about projecting matter about an axle or axis camping or oblonging a pattern with the spin as the spin is occurring the pattern of throw from the axle Remains the in the direction the cam lobe is pointing possibly causing the unit being used and it’s housing being thrown in the directions the cam lobe is pointing? Gyroscopes are interesting but not antigravity. Google “Laithwate controversy”. On the other hand spinning liquid helium appears to affect nearby accelerometers and no-one knows why, this is the subject of continuing research by Tajmar and others. 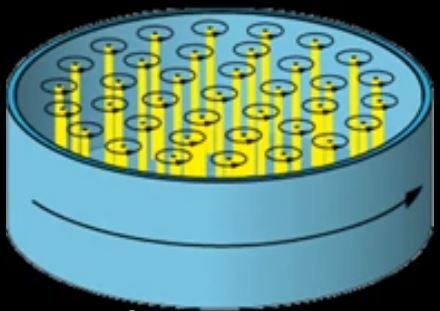 The earlier Russian experiments with spinning YBCO disks seem to have been a combination of Archimedes effect from the evaporating LN2 and the weak magnetic field from the axis of the disk, all superconductors do this which is why it was used in “Gravity Probe B” to track the axis of a rotating niobium/titanium sphere. Some of the anti-gravity crafts use spinning mercury, if I remember correctly. The FLUXLINER is the name. I attempted to make anti gravity machine once but people kept discouraging me so I canceled my project but I found myself making a huge progress so instead of negating earth’s gravity I made it to compress gravity in a certain area around laser beams witch moves at light speed after that I made it so I can control the amount of energy used once turned on the device created a black hole (a small one with 3.5 inches diametre approximatly) and by controlling the energy used to power it up I managed to make the black hole bigger or smaller or shut it down ! Interesting, can you share the schematics please? I can’t seem to get anything to happen on my test setup, but beware there could be negative effects on biological tissues due to differential shearing forces from the varying gravity within the E-R bridge. In fact this could be very dangerous so the best bet might be to go low tech and use a vacuum tube based “drone” with minimal number of mechanical components and a sequential “Nipkow Disk” based viewer. Buy yourself a nano drone and rig it up with your own modifications- prices are reasonable. And by the way what you’re doing is really dangerous and can have adverse affects on the corporeal body- and if you happen to get too close you may ‘lose’ certain parts of your body.Hard to explain but it’s happened to ppl before. Make sure you thoroughly research this- creating any artificial worm hole or tear/slip in the time/space continuum can be risky.The locational point you have created in your room, will have an opposite ‘locational point’ at the other end of the wormhole – but who knows where that is. The opposite locational point will vary, dependable on how much energy is expended to open up the worm hole + varying degrees of gravity within the wormhole. Be careful. 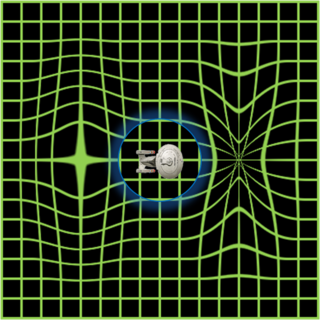 And to make it out the other side of the wormhole or ER bridge, your little drone needs to be moving faster than light with a curve at an angle shallower that 45 degrees. Maybe is the minimum velocity to escape with the flux capacitor fully powered?! I posted this “theory” on El Reg a while back and people seemed to support it. The biggest problem I see with this would be to get the drone back through the worm hole to the departure location. Because you couldn’t remote control it on the other side. -What do you mean by this? Guys check out..*SEARL EFFECT GENERATOR*.. Which ‘Faces of Death’ movie are you referring to? There are at least 3 or more, if I remember right. I used to rent them on VCR tape. Mechanical and Aerospace Engineer for Lockheed Martin. Love all the optimism on the zero gravity space drive one of my many projects many years away from even field test. There is a new form of space travel that the head electrical and sound/wave engineers in the partial physics dept are currently developing a new form of space travel l, not a warp drive or wormhole a actually to date possible advancement with out current state of technological advancements. The rhetorical pulse ion drive is real… Not in application yet but can,obtain plausible light speed utilizing new forms of lasers and specialized sound waves colliding to create a inexponetional capability of speed. It will,just keep going faster and faster till it reaches the speed of the nearly developed ion,laser drive. Currently our most advanced space shuttle travels at 84,500mph relatively based on earth velocity. The concept behind this new drive are awsome.,utilizes solar sales and laser and sound burst along with zero gravity creating a inexpotential capabilities of speed. Only issue is chatting a craft that can see obsticales in warp Kanye utilizing a laser sonar system that moves after than,light to bring space telemetry to the on board computer. So much in the works that’s so amazing. We have oficially created a laser that on a us navy vessel with the capabilities of taking out any target with less that a dollar in,cost and can,eliminate any target immediately. Videos on,youtube. Same laser tech is being used by us to give u a idea in the future or real warp technonlogy. Even if we can,travel fast as light we would,need to slow down to brig of up toward and,future space telemetry and,i don’t even think there is a supercomputer in the world that could,compile all that Dada in real time. Looking toward to,working on the future. Keep up the high hopes. All will be revealed eventually trust me we wouldn’t build these things if we didn’t plan to use rhem. Feel free to,pm me with any questions. Space travel is on,aof my obsessions and one of my big side projects is my zero gravity generator that can,control the electromagnetic field,utilizing man-made elements I can’t list. When,completed,will,give allow for up,to light travel without affecting the human,anatomy of anyone,on board u would,be protected from,the ion,pulse drives effects. I don’t know about y’all but I’m so excited to see the future. Hope everyone gets to see the new projects and developments upcoming in the gov tech community. Keep up the dreams, aspirations and all will be revealed. Hopefully. P.S ask away if any questions,pertaining to the subject. A theory is like an noodle strainer it has shape and substance but it has a bunch of holes in it and therefore it’s not a valid nor solid construct so the thought in the belief that at the speed of light something would have infinite Mass is completely wrong as it’s just a theory that doesn’t have any verification which doesn’t mean it’s true. i have one thing to give you as an idea. Ever play with a gyroscope? Spin it up and tilt it from sided to side and notice the force it applies to you hand. Since your into physics, what would happen if you took 2 opposite rotating gyroscopes in the vertical position and 2 opposite rotating gyroscopes horizontally mounted together? And, they need to be made out of magnets. Have been reading every thing I can on using magnetic fields around an object.Woulf really like to know how a vehicle with a strong magnetic field would react in space.Possibly to move the vehicle and what secondary effect it would have to the inside of vehicle. 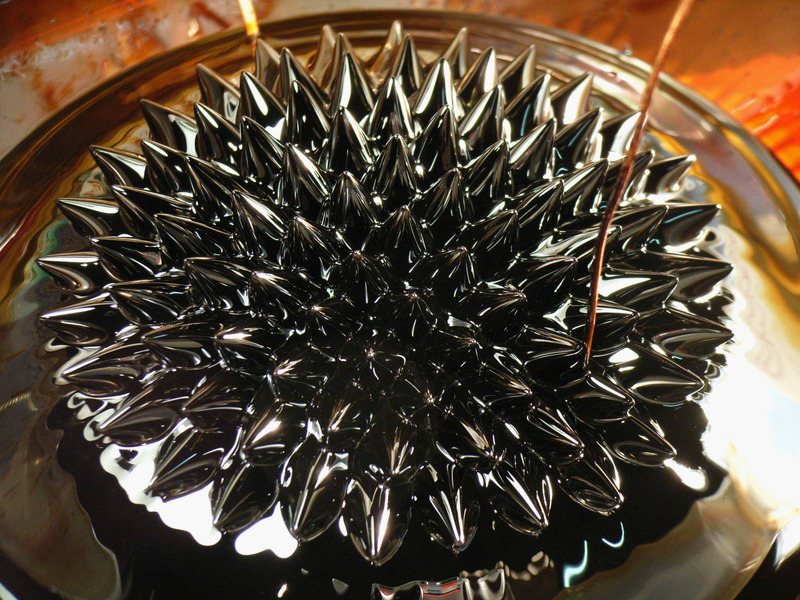 The problem with the ferrofluid is the enormous amounts of centripetal force involved with the structural stability of the material it’s constructed of… So far. I’m planning on solving gravity. I believe Einstein was just about to get it done and got stuck, because he’s absolutely correct if I succeed in my testing with my device. Whenever I can afford construction that is… Space is actually a very real fabric in every sense of the word. Constructed of strings and everything. Not nothing, as many in science explain it, or more horrible farfetched mathematical puzzles. We are pushed back as we displace it’s fibers with our atoms. Mass is the push between them. Therefore the faster you move, the harder you push, the more mass you have. Space has mass. Electromagnetism has mass when it’s movement can potentially push another object via its magnetic field. The definitions are wrong! Distorting space around you will create gravity. I believe I know how. And many other things like wormholes are possible if I can provide proof. Help is appreciated! Actually in space we would need to build a gravity device(drive) there being 0 gravity in space introducing gravity would be like a magnet ( if this makes sense to you?) So then you could match gravity resolution at any giving point and wala speed would be no object. There are so many variables to space travel. Slowing the machine down would then need reverse gravity propulsion system. A very inact guidance system etc…. People who think bob lazar was a phony need to think out of the box. Universities today are producing PhD who just follow the existing theories and refuse to stand back and admit their dont’t Have a idea how things work in the universe. Can you actually build an electronic device outta this elements?? I have been studying Anti-Gravity, Anti-Magntic Propulsion system since 1976. I seen my first U.F.O. in 1959. The next 1971 Vetnam with witnesses. 1972-1976 several sightings, With witnesses. Got close as 40 feet from one. (NM) In the UK 1979 150 feet overhead , traveling south let than 40 mph. Showed up on radar and several eye witnesses. When they operate at low power, they want to be seen. Radar will bounce back to receiver or transmitter. On this Ship I could see the outline of the ATG field and the reaction against our atmosphere and gravity. al steps to producing this field, 1 magnetism, 2 Unified, 3-4-5-6-7. This type of knowledge must be protected. I will say this the field produce ,gravity waves must travel around it. That would be a good start. THE TOPIC I CLICKED WAS ANTI GRAVITY DEVICE BUT NOT ESCAPE VELOCITY. AS THE HEADING OF THE SUBJECT TOO IS ANYI GRAVTIY AND NOT ESCAPE VELOCITY. THESE TWO ARE TOTALLY DIFFERENT TOPICS AND SHOULD BE CONSIDERED AND TAKEN AS SEPERATE ONES. SO FAR ANTIGRAVITY DEVICE IS CONCERNED I AM WORKING ON THE VERY MACHINE SINCE LONG AND HAVE DESIGED A SORT WHICH OVERCOMES GRAVITATIONAL PULL AND USES NO AIR PROPELLING. I had to take a break from playing with kittens to write your article. A big thanks for your article! If your articles are always this useful, I’ll be back soon. I truly love this work a bunch! Will you be writing any more articles on this subject? Because I’d sure love to learn more about this. This stuff is awesome! This is a very efficiently presented page. Any additional recommendations you’re willing to share with me? I really appreciate this write up. Funny thing I thought I was a pro before reading your website but it turns out I am a dum dum. This will definitely be very useful for me when I get a chance to start my own blog. Why discredit bob lazar like that? Is it because what he is telling is impossible to recreate with the knowledge we (publicly) have available? I mean if it is something that is true wouldn’t it be very confidential and top secret? Every scientist always has to disprove things because they didn’t learn that or in their world it is impossible? It’s a bit sad though IF (I’m sceptical as well) if his story is true and everyone disbelieves him.. Traveling in 4 or 5 D faster than light instanteniously combining warp plus thought. You,re absolutely right but moving at c would atleast allow easy invention of time travell machine.Thanks to the physics laws which help to solve the wormhole system that is affected by negative energy.The answer of this is to play with anti-gravity which will bring installation of colonies in the past,future and even the entire urniverse. The 1992 experiment of the scientist Eugen Podkletnov, a very complex device with superconductors, using a high-speed device in liquid nitrogen and ultra-powerful magnetic field, claiming a weight reduction of 2%. Unfortunately, the experiment could not be reproduced. I made an classic electric motor and a drive system to rotate the weights of the device at a certain angle and a certain speed so the weights “float,” a powerful centrifugal force is generated, which virtually cancels the gravitational force of the trained masses. The MAGIC engine is a device that by rotating a mass at a certain angle and a certain speed cancels 86% of the weight of the masses. This method was applied to the design, experimentation and realization of the centrifugal inertial antigravitational engine. I need comments.I’m waiting for talks about my MAGIC Engine.